This quarter’s Postdoc Spotlight is on Brittany Nelson-Cheeseman (MSD), how she landed her dream job and how you can too. Brittany’s passion is in teaching and performing research in materials science and engineering (MSE), and recently she landed her ideal position: a tenure-track assistant professorship in the School of Engineering at the University of St. Thomas (UST) in St. Paul, Minnesota. Brittany is excited about her new adventure. She will be able to not only teach undergraduate and master’s level courses in engineering, she and her students will also have the opportunity to collaborate with researchers at the University of Minnesota. This position allows her the best of both worlds: the ability to focus on teaching MSE and the opportunity to advance her research, attend conferences and apply for grants. 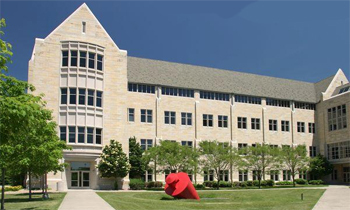 The University of St. Thomas is the largest private university in Minnesota. With more than 10,000 students on the university’s rolls, Brittany has a wide group of students to teach. The university is focused on liberal arts and sciences and mixes things up by combining interdisciplinary themes and humanities so students have a wide-lens focus. When looking for a faculty position, Brittany considered if working at a smaller university focused on teaching would affect her ability to teach MSE and perform research. Generally, teaching-focused institutions do not focus on MSE. What helped Brittany in her decision was that she would sorely miss the engineering aspect of MSE, but still wanted a liberal arts teaching model. UST provided an unconventional setting that met her needs. “I found the university to be unique, with an engineering program housed inside a liberal arts school,” says Brittany. Her first year on the faculty will find her developing and teaching one course in Engineering Materials each semester with 48 students and joining them in the laboratory for four, two-and-a-half-hour laboratory sessions each week. She will also oversee a senior design team during her first year. She will then ramp up her schedule in year two, teaching two courses and carrying out one accompanying laboratory course. Landing her dream job was no easy task. “I knew this was a unique opportunity since faculty positions are hard to come by, especially in the places one would like to settle down in,”; said Brittany. She prepared by spending more than a month and a half composing, editing, revising and rewriting her application materials. She had many different people from various backgrounds and circles review her materials, including her parents, friends with Ph.Ds. and others without scientific backgrounds. The interviewing process was fairly strenuous and detailed. She had a phone interview that involved multiple people in a conference call type setting. She found thoroughly researching the institution beforehand by reviewing their website, school mission statement and faculty members helped tremendously. Brittany had UST’s web site open and available as she went through her phone interview. “They are basically looking for whether you know what their specific school is about,” says Brittany. The clincher was being able to convey to the search committee that she knew the university’s vision, how she would fit in with that vision and how her unique talents would enhance this vision. She then was flown out to the UST. Brittany met with small groups of faculty members throughout the day of the interview. Many of the questions centered on her teaching style, philosophy and future plans. She had prepared by reviewing lists of interview questions, writing out notes of responses and talking points to speak on. Brittany was also asked to give a 45-minute presentation on her research that demonstrated her teaching style and was geared to an undergraduate audience. She built her presentation around a step-by-step framework of how to attack a materials science problem and provided her research performed at Argonne as the solution. This working model demonstrated exactly what she would have taught in an actual class if she were hired. “They want to see that you are excited about the institution, the position and that you get along with the community well,” says Brittany. She made sure to show she was passionate about her research and teaching and that she would offer a fresh perspective in these areas. “Being innovative in your approach, developing your own vision and making them see and believe in your vision are critical,” says Brittany. It may seem hard at first to be a salesperson for oneself, but this is precisely what one needs to do. Brittany was dynamic and engaging, and she communicated her story in a fashion that revealed to the committee that she was the best choice for this position. Brittany also was able to grab the attention of the search committee upfront with an in-depth cover letter. “The most important part of your application is your cover letter,” says Brittany. “Do not skimp on it.” Many times this is all that committee members will read. So a cover letter that hits the main points of why you and this specific institution are the perfect match in the first two paragraphs will make all the difference. During the contract negotiations, Brittany found that the initial start-up funds were much less than what she expected. She was able to articulate to the committee that she would require more funds and provided a detailed list of quotes for the equipment she needed. Her ability to frame this in a concrete way that showed she would achieve success for the university, students and her research goals were justification for the higher start-up costs she was requesting. “When you have an explicit plan with a list of quotes and equipment, it comes across much more convincingly,” she says. Brittany begins her new position this fall. Brittany Nelson-Cheeseman (MSD) is originally from Minneapolis, Minnesota, so she is no stranger to cold weather like we experience here in Illinois. She has been a Postdoc at Argonne since 2009 and currently is working with Anand Bhattacharya in MSD, creating novel oxide films and superlattices. Brittany is exploring these new nano realms in order to uncover undiscovered magnetic and electronic materials for energy applications. This entry was posted in Postdoc Spotlight and tagged Brittany Nelson-Cheeseman, postdoc spotlight, research. Bookmark the permalink.